Amber Jane Butchart dropped by a few weeks ago, as part of the University public lecture series, and talked about her new book to a packed lecture theatre in Eldon Building. She was very happy to be back in the city as she explained that her initial research for the book had brought her to Portsmouth Historic Dockyard. The audience included large cohorts of fashion students, not only from the University of Portsmouth but also from South Downs and Highbury – such was her reputation and knowledge on the history of fashion. Amber sported one of her famous turbans and radiated energy and style. Aided by a collection of images from her book she talked us through the influences of the sea and seafarers on fashion trends over the past 200 years. However it is not only the British Navy that has influenced fashion – fishermen, pirates and mermaids have also played their part. So when did the the sea start to influence fashion trends? It all started in 1788 when the British warship Arethusa opened fire on the Belle Poule, a French frigate off the coast of Brittany. The Belle Poule suffered heavy casualties with 30 dead and 72 wounded but the vessel remained intact unlike the Arethusa which lost a mast. This battle triggered France’s full involvement in the American War of Independence, siding with America against Britain, and was so famous Amber tells us that “back in Paris, women of fashion marked the occasion with the coiffure a la Belle Poule, an elaborate hairstyle containing a replica of the ship itself”. 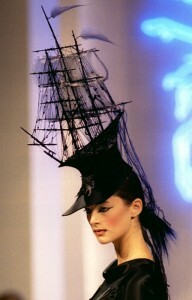 Two hundred years later that same headdress was the inspiration behind Philip Treacy’s 1995 ship hat and he has since reprised the idea several times. See here for more examples. Read more about ship headdresses (and their part in history and politics) in a blog written by Dr. Kimberly Chrisman-Campbell who is an independent fashion and textile historian. Since then the maritime traditions of France, the United States and Britain have provided inspiration for the world of fashion. The emergence of dress uniforms for Admiral Lord Nelson and his officers also provided inspiration for a style that has never quite gone out of fashion. Gold braids, buttons and epaulettes have appealed to both sexes. We were able to see first hand what one uniform looked like when a member of the audience, who was dressed in a a copy of an admiral’s uniform of the time, gave us a detailed description of each element of his attire, including tricorn hat and sword. This was great fun and we were all able to share in a memorable fashion moment. Flamboyant excess also contributed to the fashionable ‘dandy‘ look when gentlemen of the eighteenth century strutted around in costly and lavish attire. Most of the bling has now disappeared, except for the more extrovert amongst us, but we still love the smart casual look of the naval officer’s blazer which can be worn by both sexes and can be dressed up or down. Redesigned and re-branded specifically for women by the designer Coco Chanel, it became the must-have staple for many fashionable wardrobes. Of course one of the most obvious examples of nautical chic are the blue and white striped top and wide legged white trousers of the French naval cadet, the top is known as the tricot raye jersey mariniere. This was later immortalised by French designers Yves Saint Laurent and Coco Chanel and worn by, amongst others, actress and style icon Brigitte Bardot. There is a wonderful photograph in Amber’s book taken in 1935. Think of the leading female Hollywood stars of the 30s/40s and you think of wide-legged linen trousers or pants with blue and white tight striped tops. If you look at fashion trends over the decades the nautical look has never really gone out of fashion. In the 19th century, the striped Breton Fisherman Sweater was designed to protect fishermen from the elements; this style has constantly been re-invented over the years. There is also the Aran sweater; the Suffolk smock; the Jersey and Guernsey sweaters. All originally worn by local fishermen to keep warm and dry during long days and nights at sea. And of course Jersey has now lent its name to a knitted fabric. Then there are the pirates! Amber tells us that “romance and adventures on the high seas are embodied by the Pirate. Designers with a penchant for historical detail and the spirit of rebellion, from McLaren and Westwood to Galliano and de Castelbajac are drawn to his excess”. Think of Adam Ant in the 1980s and more recently, the Pirates of the Caribbean leading to another popular revival. This time round it’s Jack Sparrow (or should that read Keith Richards?) lookalikes: some good and some bad (very bad!) This look has proved irresistible for many extroverts with a rebellious streak. And lastly we have the mermaid, a mythical figure which has inspired designers such as the late Alexander McQueen and Jean Paul Gaultier. Amber tells us that “the designer Karl Lagerfeld staged an underwater kingdom for his Chanel ready-to-wear collection…..Pearls were strewn through models’ hair and around their waists, while mother-of-pearl glistened through fabrics and on seaweed-like ruffles”. Read this book, it’s an inspiration and the images are exceptional. We have two copies of Nautical Chic in stock on the library catalogue here. However Amber’s not all about sandcastles and sea shanties. Here I have included a YouTube video where she demonstrates her diverse interests in the history of fashion by appearing in a 2012 BBC Breakfast show discussing the style of Margaret Thatcher. If you are interested in the ‘history of fashion and related trivia’ see Amber’s other book here. And look out for her new book coming out in September entitled: The fashion of film: how cinema has inspired fashion. We have ordered it for the library. See the My Subject pages for more resources for Art and Design and if you want to find out more on the history of fashion see the link to the library catalogue here.